Ireland’s 4th National Workplace Wellbeing Day is on Friday, 13th April. 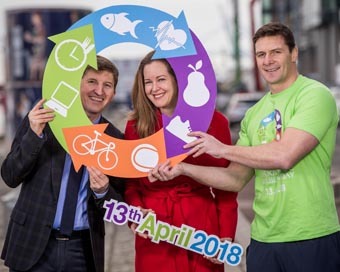 Ibec, which is supporting the campaign, is urging employers across Ireland to do something special on the day to promote better wellbeing amongst their employees. And, the business and employer organisation is leading by example. Danny McCoy will be leading Ibec staff in the Lunchtime Mile, a one-mile walk in the vicinity of the organisation’s Head Office on Dublin’s Lower Baggot Street. Ibec is also hosting a free breakfast seminar for employers and HR executives that will kick-start the day with ideas, insights and tips on how workplace wellbeing can help organisations. There are still some places available for the seminar but they must be reserved in advance. Wellbeing expert, Dr Mark Rowe; former Munster, Ireland and Lions rugby star, David Wallace and consultant dietician, Sarah Keogh will join Danny McCoy to discuss their insights on wellbeing. Sky Ireland’s Head of HR, Aoife Ni Mhurchu, and Sinead Doherty, CEO, Fenero, will also share their experience on how companies can successfully implement wellbeing programmes into the workplace. They are among hundreds of employers across the public and private sector who have signed up to participate in the campaign, which is an initiative of Food Drink Ireland. Others include Fexco, Lucozade Suntory Ribena Ireland, The National Rehabilitation Hospital, Nestle Ireland, Peter Mark and Port of Galway, to name but a few. Approximately 11 million days are lost through absenteeism every year at a cost of €1.5bn to the Irish economy. Healthy, engaged employees, meanwhile, are, on average, up to 30 days more productive. Research amongst employees in Ireland conducted by Behaviour and Attitudes for Food Drink Ireland, who are behind the campaign, shows that the majority of workers are more likely to stay longer with employers who show an interest in their health and wellbeing. Furthermore, half would consider leaving employers who don’t. (Pictured: Dr Mark Rowe; consultant dietician, Sarah Keogh and former Munster, Ireland and Lions rugby star, David Wallace will join Danny McCoy to discuss their insights on wellbeing Friday 13th April, 2018 as part of Ireland’s fourth National Workplace Wellbeing Day seminar at Ibec).